Imperfectly Painted: How does it feel to be 24? & Giveaway Winner! Hasn't that always been an awkward question? I found it always so strange when it's your birthday for people to ask how it feels to be X years old. That being said today is my 24th birthday and it doesn't feel any different than being 23...or 22. I'm not sure what exactly you are supposed to feel when you age one more year :P. I'm sorry I sound cynical! I am excited about it being my birthday though! Birthdays after 21 lose their excitement which is fine by me I never was one to really go all out for birthdays. I just like celebrating with close family and friends by doing fun activities and having a nice dinner. My boyfriend and I are going to have dinner tonight at Downtown Disney and my parents are coming visit for a few days on Sunday which I'm looking forward to! I haven't seen them since February. I'm excited about the next 2 weeks! I figured I'd share with you the polishes I got for my birthday from Lacquer Ware for Tips and Toes! She's so sweet from sending me these goodies. I really appreciate her kindness and her friendship. She's an all around great gal! Branding Iron is up there in my favorite China Glazes of all time. It's not surprise because in my opinion it came from one of their best collections Rodeo Diva. 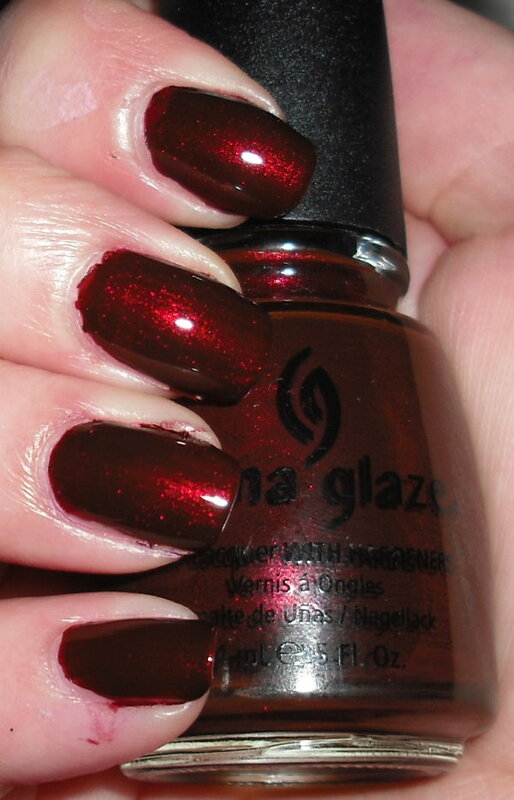 Branding Iron is a rich burgundy shimmer that practically glows in sunlight or any kind of kind of light. I love colors like this rich bold colors are my style. Wee!!! Wagon Trail has been on my lemming list for some time now and I'm so happy I have it now! It is also from the Rodeo Diva collection. 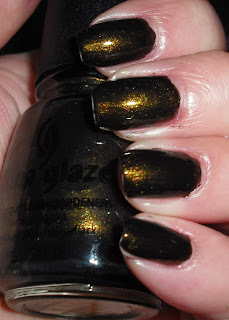 It's a black creme mixed in a deep golden shimmer. This one of those one-of-kind color! I could say more, but this one speaks for itself! 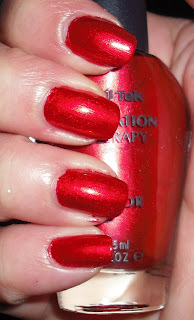 I didn't know Nail Tek made colors, but I'm not complaining. This is a beautiful pearl-like red. I'd say it's a true red with beautiful shimmer. I love reds and this is no exception of love the finish of it best of all! This was a franken made by Lacquerware of Tips and Toes. Isn't it gorgeous! I have zero colors like this. It's a rosy pink foil. It has a metallic silvery quality that is very unique and pretty. It's a great franken! Orange Sorbet was another one on my lemming list. Doesn't this color look delicious though I don't recommend eating it. It's lighter orange with gold shimmer throughout. Gold shimmer again a favorite of mine. It makes me think of orange smoothies and tropical locations. It's a very pretty color. Now it's time to announce my giveaway winner! I want to thank everyone for entering it was fun! That's it for today! Thanks again to Lacquer Ware for these and making my birthday a little extra special! Happy Birthday!!! I have Wagon Trail and love it too. They all look great on you! Happy B.day!! Have a nice day! Also: those colors are gorgeous! Happy Birthday and Congrats to Deanna! Happy birthday! I just got Branding Iron in a little swap the other day and I can't wait to use it. 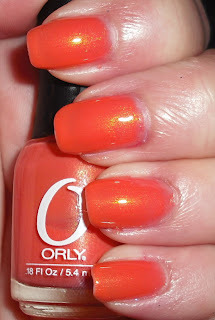 Orly's Orange Sherbert is so pretty - such a gorgeous color! Happy Birthday! Enjoy your celebrations! I don't like to go all out for my birthdays either. Those colours are all gorgeous, especially Wagon Trail! Congrats to the winner And HAPPY BIRTHDAY Stephanie! Your parents can not wait to see you for your Birthday. Happy Birthday!!!! Happy Birthday! I hope you have a wonderful day and do whatever your heart desires! Your nails look stunning! HPB to you. 24 and already so jaded? It's OK. When you get to my age (54) birthdays start to get exciting again because all the old fashions have come back and you feel as if you're 17 and you have grandkids so you get to play and read kiddie books. It's great! Happy birthday! And enjoy the next 2 weeks then, it's always nice to have days to look forward to! I can't imagine not seeing my parents for that long, must be great to see them again. Nice polishes, especially Branding Iron I like a lot. Happy Birthday! I know exactly what you mean, I turned 30 in March, I still think I am 23! Hooray, birthday post! Happy Birthday! Again. I turn 24 next month, so I know what you mean about people asking questions like that. Love the polishes. I think Orange Sherbert looks pretty similar to Zoya Gwin. Happy birthday!!! I turn 29 in a couple of months and I don't wanna!! hahaha. Happy 24th birthday Steph! 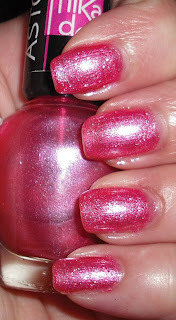 :) I love the Rodeo Diva collection, all the colours are very stunning. Although I already have dupes for Branding Iron and Scarlet Scarlet. And congratulations to the winner of the giveaway.